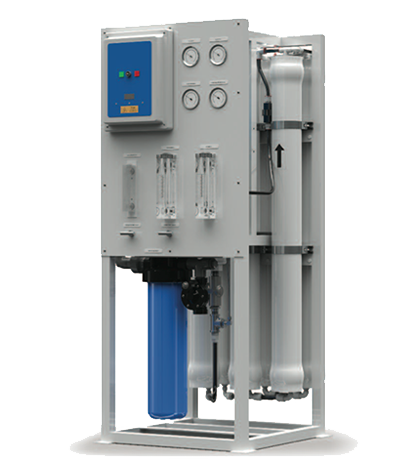 R1-Series Reverse Osmosis Systems feature a new, innovative and expandable design. These systems feature only the highest quality components, including a programmable computer controller with many built-in standard features, a stainless steel booster pump for high performance and corrosion resistance, extra low energy membranes and fiberglass membrane housings for enhanced performance and durability. R1-Series Reverse Osmosis Systems have been engineered for capacities ranging from 1500 – 9000 gallons per day. * Product flow and recovery rates are based on equipment test parameters. *** Treatment ability of the RO system is dependent on feed water quality. Performance projections must be run for each installation. Test Parameters: 550 TDS Filtered (5 Micron), De-Chlorinated, Municipal Feed Water, 65 psi (4.5 bar) Feed Pressure, 100 psi (6.89 bar) Operating Pressure, 77 Degrees F (25 Degrees C), Recovery as stated, 7.0 pH. Data taken after 60 minutes of operation. Low temperatures and high feed water TDS levels will significantly affect the system’s production capabilities. Computer projections should be run for individual applications which do not meet or exceed minimum and maximum operating limits. Scale prevention measures must be taken to prolong membrane life.